Cover art: Lorraine Bonner, “Internalized Perpetration,” 13″ x 13″ x 10″, clay, 2001. In this issue of Inquiring Mind we live up to our name, inquiring not only into the mind, but also into various methods that humans have devised for that inquiry. 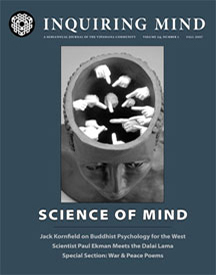 Jack Kornfield compares Western and Buddhist psychologies. Is the advice dispensed by Thai meditation masters a more enlightened form of “therapy”? Psychotherapist Ronna Kabatzick brings what she learned in the east to her work in the west. Meeting—and then writing a book with—His Holiness the Dalai Lama changed emotions expert Paul Ekman‘s life. Psychologist Richard Hanson and neurologist Rick Mendius look at the intersection and integration of psychology, neurology and contemplation. Lynn Crawford shares the tale of her lifelong journey of letting go and of wanting a “better ending” to the early loss of her mother. Psychiatry and psychology professor Zindel Segal discusses relationships between depression and creativity, attention, meditation and medication. David Foecke challenges our community to explore the “all-dana” model for financing vipassana centers and supporting teachers. Ajahn Pasanno teaches us the value of bringing the practice of generosity into the center of our lives. Barbara Gates brings her gift of finding Dharma in everyday life out onto the clothesline. As an expression of our heartache over our world at war, we offer a tribute to “Cambodia’s Gandhi,” the late Maha Ghosananda. Trudy Goodman recalls traveling with him in 1987. Peter Gyallay-Pap tells the story of the late Ven. Maha Ghosananda, “great proclaimer of joy,” the peace-activist monk who was Cambodia’s spiritual leader. Wes Nisker opens his journals to share his pithy and insightful musings on science and why he loves it.